The renowned medieval cathedral in Chartres, officially named Cathédrale Notre-Dame de Chartres, is one of the finest examples of French Gothic architecture. It was built between 1193 and 1250 and is characterized by beautiful stained glass windows and two contrasting spires on the west façade. Since the 12th century the cathedral attracts many Christian pilgrims and even today many travellers pay a visit to Chartres to admire this piece of Unesco World Heritage. 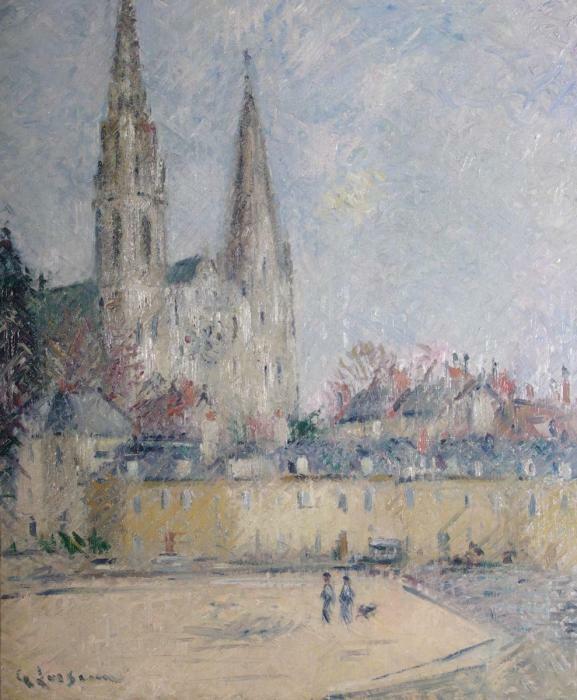 Gustave Loiseau painted the west façade of the cathedral with its two typical spires. He rendered the structure of the surface with his characterizing ‘cross-hatched’ technique, called en treillis (latticework). This technique, in which he uses thick strokes that evolve gradually to form a kind subtle latticework, results in a certain vibrancy and gives his paintings the supple, almost touchable quality he is known for. Combining this technique with the composition shown here, the uprising form of the cathedral and the diagonal strokes of brushwork, Loiseau created an interesting and playful piece. Gustave Loiseau was born in Paris in 1865 and already had artistic aspirations at a young age. He was attracted by the luminous and airy landscapes of his teacher Quignon, but was disappointed by his methods, such as painting after sketches made in a studio. Loiseau, like Monet, felt that a canvas should be painted directly from the subject, thus creating spontaneity, freshness and inte . . .